This is one of my favorites: ornate, but not merely for the sake of being ornate. The extra elements enhance, rather than distract from, the overall beauty of the home. There is a sense of balance -- even happiness -- about the house. It really stands out amongst its neighbors. It was in response to a letter I sent to the owners of Buck's homes that Kelley Peace wrote to me. Her family purchased this home in 1994 for $415,000, and lived there until 1997 when they sold it to Peggy and Henry Hibbert. A number of improvements were made by the Peace's, including the removal of the boiler from the basement and all the radiators from the house. They refinished the floors, removed layers and layers of wallpaper from the walls, prepped the plaster walls, and repainted. They hung beautiful silk draperies in the living room and a wonderful fabric in the dining room. Even though she only lived in it a short time, Mrs. Peace had a great love for her home, as evidenced by this letter I received from her in September, 1997. In December 2001, Henry Hibbert dropped me line. Buck's legacy is safe with the Hibbert's. How wonderful it must be to be associated with such a wonderful family! I received your letter addressed to "Owner of a Lewis Crook Home" about 2 years ago. At the time, my husband Bill and I had bought this beautiful home from Anne Patterson Barnett, who inherited it from her uncle, George Goolsy. He had been the third or fourth owner of this magnificent home, built by Mr. West of West Lumber Company. Bill is an Interior Designer with the firm Gandy/Peace, and I have always been interested in Classic architecture. When we got a call from a neighbor that this house might be coming to market, I drove by the house and left my business card on the door. Anne's husband called me, and we had a wonderful conversation. I met him later that week at the house, and knew that I just had to somehow figure out a way in which we could live here. At the time, we had a 2 year old, who is now (almost) five years old. He has a baby brother named Will. I had hoped that this would be the house I died in. I cannot tell you how much I love it... the lines of the house, the detail in the living room, the scale of the house, the thoughtful detail in every room, the majestic ceilings... there is nothing about it that I dislike. It was meant to be that I should be here... for awhile. When I was single, I lived in a condo on Peachtree Road and used to run down Peachtree Battle 3-4 times a week. 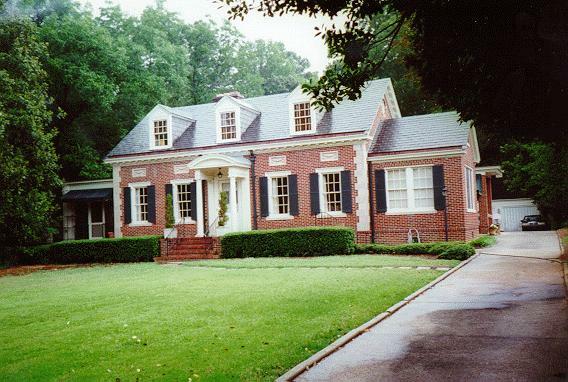 Each time I would stop and stare at the house on the corner of Peachtree Battle and Nacoochee... something about it fascinated me... and it was always my "favorite" house on the street. Now I know it to be your grandfather's own home. Fate is peculiar... but now comes the sad part. It has been an extrememly difficult year for me... [and due to unforeseen circumstances], I have to sell the house. I am staying in the neighborhood, because I truly love the area... I went to college here... and I remember walking to Emory in the early mornings, and to the VA Hospital, through Lullwater Park. I sold the house to a nice couple: Peggy Hibbert is a real estate agent in the area, and her husband, Henry, is a Fulton County District Attorney. They have 2 boys, ages 10 and 13. I know they will be happy here, and they seem to love the house as much as I do. I have sad feelings about leaving, but I know I would have some sad feelings if I stayed... I had so hoped that we could be here forever. I want you to know how much I would've loved your grandfather. I have read a LOT about him. We got the original house plans (his writing) from the History Center, and of course I've read the book that your mother commissioned Bill Mitchell to write... it is well written and representative of his work, I do think. I am moving to a Craftsman Bungalow on Oxford Road, and I hope someday to live in another beautiful Lewis Crook home. My best regards to you and to your family. If you have any questions about the house, or if you want to see it before I move, do not hesitate to call me or e-mail me. You should see the house now. Of course it doesn't look any different, except the new curtains add a graceful curve imparting yet another detail of happy elegance. The kitchen will be featured in an upcoming edition of Bath and Kitchens, a magazine produced by Homes and Gardens. We're very excited. The House was on the Druid Hills tour of homes for the first time this year, and many people said it was their favorite of all. Your Grandfather would have appreciated the care with which we integrated new features into the old. For example, the typical beadboard butler's pantry was echoed across the plane into the cooking area; we modified one of the walls and opened it up between the nook and the cooking area, a very practical yet unobtrusive interior alteration. We have done much to maintain the integrity of the house, including new copper plumbing, expertly done refinish of the oak floors, and beautiful interior paints which are muted pastels in keeping with the nature of the house. The amazing thing, and you'll like this, is the remarkable strength of the house. There is cement behind the bricks all the way up to the roof! Built like a church - no surprise there. We are members of First Baptist in Decatur, one of L.C. 's projects, and the similarities are striking. Your Grandfather and God are with us wherever we go - certainly he is still building beautiful structures in paradise, having shown us perfection here below. PS - You have a standing invitation to visit; and we hope you do sometime.